Standing in the playground ready for the kids to finish school, sitting at the doctors surgery while waiting for your appointment and stood at the bus stop longing for your ride to town to arrive are all moments where our smartphones keep us entertained. We can connect with friends via social media, watch some funny movies clips on YouTube or just play our favourite games to kill 5 minutes of boredom. That is of course if we have internet connection at the time! BT has developed a great new app which enables customers to connect automatically to wi-fi while on the move. There are no annoying and time consuming log in sessions to worry about when you reach a hotspot and once you access the app just the once you will connect to BT Wi-fi when out and about every time. With a network of over 5 million hotspots within the UK there is bound to be one nearby to provide you with access to your favourite websites. Users can connect to the internet wherever they may be and when you are a BT broadband customer it's completely FREE. Log in to the app using your BT ID or @btinternet.com/btconnect.com email address and password. If you don't have this available visit www.bt.com/password for assistance. If/when you are asked to enter a PIN use the same PIN used to unlock your device. The profile will appear as 'unsigned' during installation but the profile will be assigned to your personal device and it is safe to use. Once complete you will be able to view your profile under 'General' then 'Profile' in your device settings. Any problems? You can tweet @BTCare or email iphone.app.feedback@bt.com to help. It's now quick and hassle-free to use the internet via your mobile phone. 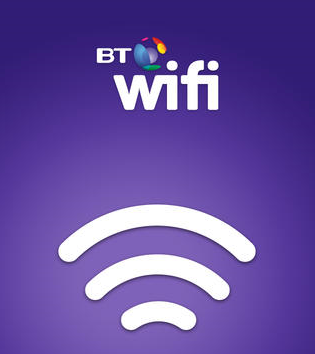 Have you downloaded the BT Wi-fi app yet? If you sign up, you agree to your hub becoming a hotspot for others to use. How secure is it? On the other hand it's great to be able to use the internet anywhere, anytime.